Unless I get a surprise seed, I know which seeds I'm going to grow next season. I got in the mail today a 1775 Starr. Along with that I'm going to plant a 1421 Stelts and a 1789 Wallace. The pumpkin that the 1775 came from was just a perfect looking specimen and maybe the biggest pumpkin that I'll ever see. It had the exact same measurements as the world record pumpkin, but went light to the charts. The fact that the seed comes from a selfed pumpkin and its pedigree is from a long line of world record producers (998 that produced 1689 WR was pollinator in 1385 that was the mother and the father that produced the 1725 WR. The 1725 was the mother and the father that produced the 1775), I think this unproven seed has a lot of potential. The 1421 Stelts seed often will produce beautiful, orange pumpkins as well as giants. Statistically it has produced the 3rd most big progeny so it is a proven producer. The number one seed of all time is the 1161 Rodonis, which I grew a couple of years ago. I'm hoping for a nice orange pumpkin that is well over 1,000 pounds this year. My third seed for this next season is the 1789 Wallace. I grew this same seed this last year and it was a beautiful plant until it went down due to yellow vine disease. The root system and growth of the plant was just fantastic. This seed produced a lot of pumpkins that went light to the chart this last year, but also produced some giants. The pumpkin with the biggest measurements ever came from the 1789 seed this last year. I'll probably also start a 924 Johnson seed as a backup this year. Hoping and praying that one of these seeds will get me over 1,000 pounds this year. This just in. 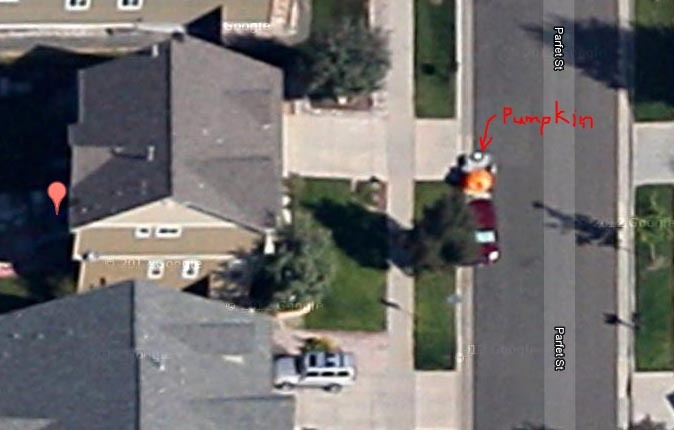 I've recently discovered that Google has been tracking my pumpkin growing from outer space! The most recent satellite photos from the Google Satellite clearly shows my pumpkin ready to be taken to the weigh-off. I suspect that some member of the growing community (I'm watching you Wiz and Scherber) has put Google up to this. I may have to start covering the pumpkin as the satellite makes its pass overhead each day. This time of the year can seem long to a pumpkin grower. We are now half way between patch prep time and the end of last season. This time of year is spent working on my website design business, family, friends, church, skiing and studying up on the latest techniques for growing a giant pumpkin. I have to admit that for the later I haven't done as much as I would have liked. The holiday season was crazy busy. This off-season I'm reading Teaming with Microbes. Definitely a worthwhile read. Right now I'm planning on adding a second water line to the patch so I can get a little better water pressure to the dan micros. Other than that I plan on doing things about the same as last year. My patch prep was different this last fall however. I add a lot more nutrients into the soil which I hope will translate into more pounds on the pumpkin.